Death Cab For Cutie Headlines Hideout Block Party / Onion & AV Fest! 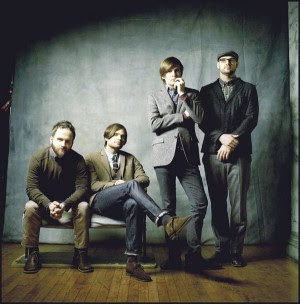 The seminal Seattle band Death Cab For Cutie headlines the Hideout Block Party / Onion & AV Fest on September 5th and 6th. This will be Death Cab’s only Chicago performance of 2014. Get your tickets now! Formed in 1998, Death Cab For Cutie is one of the best indie rock bands to date and from humble beginnings have had a massive reach with their songs. One of the things that is most striking about Death Cab’s Ben Gibbard is his ability to create a sonic blueprints that are delightfully simple yet innovative. Few musicians have such a way with writing lyrics– formed almost as complete sentences and melodically structured the same– like Death Cab. By their seventh studio album, many bands are running out of creative steam and original ideas. But in the case of Death Cab for Cutie, nothing could be further from the truth. 2011’s Codes and Keys is singular in the quartet’s catalog when it comes to sonic exploration and lyrical ambition. A band that gets better with age is a rarity but this band has never sounded more excited to experiment with textures, words, and sounds. Take a listen to the Hideout’s top 5 favorite Death Cab Songs now! Get your tickets to the Hideout Block Party / Onion & AV Fest now!